← Book Fair Frenzy: Cover reveal and blurb! It’s here at last! Meet the irrepressible Alice Peavely, the imperturbable Macalley, and Alice’s friends and rivals in their debut novelette, Book Fair Frenzy (Or, Macalley Turns The Page)! Or you can help support my work and spread the word by buying a nicely formatted and ready for your tablet or phone copy on Amazon! Click here for the US link, or search your local Amazon store. Do whichever you like, and do it without guilt. I’m fine either way. (And doing both wouldn’t hurt!) But please, please, spread the word. Review, retweet, share the Facebook post, blog, mention it to friends over a hot cup of tea, whatever works for you. And enjoy! I had a lot of fun writing this, and I hope you have as much fun reading it. It’s Alice Peavley’s first book fair in her new hometown of Darbyfield. Things are going well…except for the incidents with the mud, the disappearance of the books her friend Mabel brought to sell. and the arrogant elfish noble who just accepted her accidental challenge to a duel. It’ll take all of Alice’s cleverness, all the brainpower of her gnome valet Macalley, and several good cups of tea to close the cover on this tale. Looking back at that chaotic weekend, it seems fitting that I started it by waking up on Saturday with a throbbing cranium. My dear friends Priscilla and Mabel had come to Darbyfield, and we had spent the night before at the fine establishment known as the Fractured Tankard. We had split several bottles of elfish wine, swapping stories and catching one another exaggerating our parts in them. Alas, said happy night inevitably led to an unhappy morning, and as I lay in the bedroom of my manor outside of town, my gray matter was now pleading for a sweet mercy, or a swift demise should mercy be in short supply. Had I been allowed to sleep three more hours, I might have been in less agony that morning. However, the additional time in Dreamland had been denied to me by a certain gnome valet who was shaking my shoulder, albeit and to his credit gently. “Madame Alice?” Macalley said. I tried to ransack my poor aching brain for a suitable reply. It had none within reach. “Aaugh,” I muttered. “I should approve, but…” I rested my aching head in my hands. “I anticipated such a reaction.” I peeked through the cracks in my fingers as Macalley picked up the small tray and presented it to me. “Your…remedy?” I lowered my hands and stared at the small glass filled with a foamy, dark-red liquid. Normally, I have a certain reluctance to consume Macalley’s remedy, which would be shared by anyone within fifty feet of the thing. The smell of it could be described as bracing, but frankly, “stomach-churning” was somewhat more accurate. So was the taste, which I knew from experience, having consumed more than my share over the last few months. However, there was no time to dally about. I grabbed the glass from the tray and downed it in one prolonged gulp. The remedy proved itself to be, once again, remarkably efficacious. The pain swiftly fled my cranium for parts unknown, and a certain vigor that I feared never to experience again crept into my limbs. “Might the bath have been drawn?” I asked Macalley. “Very good, madame.” He bowed slightly, which I had come to know meant he was pleased, and left the room. I hopped off the bed and headed for my morning bath. There was very little that could have stirred me into action on a morning like that, but the Darbyfield Book Fair was in that category. I had been looking forward to that for weeks, and it would have taken two broken legs or a long-term incarceration to keep me from being there. A mere hangover? Pshaw. This was to be the first book fair I had attended since I had come to live at Peavley Manor. It had once belonged to my dear Uncle Clarence, who had passed from this world late the year before and bequeathed it to me in his will. Things had gotten a bit prickly after that, as both relatives and bureaucrats tried to claim it, but in the end I wound up with possession. I also wound up, to my initial surprise, with a valet. Macalley had served my uncle well for many years, and Clarence had made it clear in his posthumous instructions that he was to stay on. Relations between Macalley and I were awkward at first, but I quickly grew to appreciate his hard work, and more importantly, his brains. He had more between the ears than any university professor, wizard, or investigator this side of the Great Detective; without his assistance, I might have lost the manor. And we found common ground in our love of books and reading. And books were also the reason I was eager to attend the fair, and not just as a customer. You will recall I had mentioned my reunion with my friends the previous evening, and the distress it had led to. One of those friends, Mabel, owned the book shop in Thorn Harbour where I had worked before moving into the manor. She had been considering opening a second shop in Darbyfield, and when I had mentioned the book fair, she jumped on the chance to sell books there like a goblin on a stray sausage, or me on one of Macalley’s croissants with apricot jam. She asked for my assistance at the fair, and I could never turn down a friend. There were also the townspeople to consider. As the lady of Peavley Manor, it behooved me to get to know them better, especially after having to untangle the snarled state of affairs following my uncle’s passing. Spending more time in Darbyfield and its surroundings, or at least not just the library and the taverns, seemed advisable. So, I had shaken off the desperate clinging of sleep, drunk as much tea as was safe to consume at breakfast, and set off in the motorcar for the Darbyfield town square with Macalley. It was a lovely late spring morning, with clouds dotting the sky, and the mud had mostly dried up from the previous week’s rains. The motorcar barely skidded as we drove from the manor to the town. When we arrived, we saw a circle of twenty tables set up in the town square. Most of them had been claimed by locals, who had brought books from their own collections or from friends to sell or trade. A few had also brought homemade crafts for sale, bookmarks and magnifiers and the like. As I glanced around, my eyes lit upon a table with a selection of bookends. One pair caught my attention. They were unicorns, hand-carved from redwood and brightly, exquisitely painted, with jewels for eyes and a touch of gold on the horns. I was in need of a new pair of bookends, and I resolved to visit that table for a closer look at some point during the fair. My resolve, however, weakened as I saw Eldric Bludergard, amateur novelist and professional prat, at the next table, hovering over his stacks of books like a bloated, mustachioed hummingbird. As if being near Bludergard wasn’t bad enough to begin with, he had been trying for weeks to get me to read his most recent book, “My Mother Wore Army Boots”, which he had presented to me with great relish. I had only made it three pages in, mostly because I found the writing style awkward and the main character, “Aldric Nudergard”, almost as thoroughly thickheaded as his author. At this point, the challenge of finding new excuses to explain why I hadn’t read the book, difficult as it was, was easier to face than the challenge of continuing to try to read it. As I desperately avoided catching Bludergard’s eye, I noticed Stibbins, noted bounder and Bludergard’s manservant, standing behind his master’s table. He was arranging a stack of books that he had carried over from a nearby carriage. I shook my head at the thought of Bludergard believing that he would sell that many books as I moved on. “Alice!” The familiarity caught me by surprise, but I dismissed it when I saw who had called out to me. Augustus Thurston was the publisher of the weekly newspaper for Darbyfield and its surroundings, The Emerald Dell Courier. He was also a key part of the operations of Darbyfield’s small library, and the head of the committee that ran the book fair. “A pleasure to see you, Augustus,” I said as we shook hands. “You remember Clarinda?” He gestured towards the short, gray-haired woman next to him. “Absolutely!” I said. Clarinda Tapping was the town librarian, and was even more well-read than I. He was gone before I finished speaking. I couldn’t fault him; an argument between the Fotheringays could deafen half the fairgoers. More importantly, the book fair was an important source of revenue for the library, from fees paid by the sellers and donations from the attendees. Augustus had to make sure that things went as smoothly as possible, and that meant, among other things, keeping the Fotheringays’ books on their table and not bouncing off the heads of a bystander or two. “I hope he can calm them down,” I said to Clarinda. “Maybe we should let them have it out,” she said with a twinkle in her eye. “We could raise additional funds for the library by charging admission.” Clarinda winked, and I laughed as we parted. I soon reached the three tables that had been rented by Mabel. She had also rented a carriage to bring books from Thorn Harbour, and was busily unloading the cargo as two men from the local public stable led the horses away. She was wearing, as always, a green dress, along with more jewelry than one would think could fit on her skinny frame without falling off. I smiled and thanked Mabel. I was wearing a simple robin’s egg blue skirt and a matching jacket, a short-sleeved white blouse, and calf-high black boots with small heels for comfort. To liven up my outfit, I had chosen a delightful, wide-brimmed purple hat, trimmed with a darker purple ribbon and some flowery touches to mark the coming of spring. I do love my hats, and even if, as many say, the world is heading down a hatless path, I shall resist to the very last and wear my chapeau of choice when I wish. “You sound quite chipper!” Mabel said as she set more books on the table. “Of course it is.” I glanced at the carriage and saw Priscilla Wentworth, my oldest friend and Mabel’s employee, coming up to us. She was staggering, but I could not be sure if it was due to the large stack of books she was carrying or the lingering effects of the wine from the night before. She wore a white dress, a blue hat that offset her wavy black hair, and an expression that matched what mine must have been when I awoke earlier. “Good morning, Priscilla,” I said with a loud voice and a grin. “What does that have to do with anything?” I took a stack of books from the carriage and carried them back. “Was she going to shout again?” Priscilla said. “No. Alice is.” Mabel gave me a glare that could have frozen a bonfire. With some welcome assistance from Macalley, we finished setting the tables up with just enough time to catch our collective breath and wonder if there might be tea before the fair opened. We had seen the crowd gather as we worked, and when the appointed hour arrived, they swarmed the tables like ants who had, after years of patient tunnelling, finally found their way into a sweet shop. It was a grueling first hour, but it was worth it for one reason alone, and it had nothing to do with sales. Mabel, with my prompting, had brought a large selection of books meant for children. There were picture books for the youngest, illustrated books for those slightly older, and adventures and romances for the ones in their teens. Children had gathered from not just Darbyfield and its surroundings, but from villages and towns further away, and they tore through the stock Mabel had brought. The exhaustion in dealing with those eager children was easily countered by the smiles on their faces, and the happiness in their eyes, as they carried their new prizes away. Forgive me for striking a tone similar to one of those traveling preachers in this instance, but I truly love reading. Losing myself in a good book is one of my favorite pastimes. Nothing can truly compare. I encourage everyone to read, even if it’s one of those books that the elitist snobs or the know-nothings treat with disdain. Even if it’s Bludergard’s book, as long as there’s nothing else on hand and you’re trapped inside due to a sudden snowstorm. Seeing those children getting so excited over books brought even more vigor to my limbs than Macalley’s remedy, and a smile to my face that lasted for some time. After the first two hours, the benches surrounding the square were crowded with adults and children, many engrossed in their purchases. Mabel knew this was my first book fair, and saw my furtive glances at the other tables. With a sigh and a smile, she gave me leave to wander the grounds for a few minutes, as the crowd had thinned out slightly prior to lunch. I carefully paced around the tables, glancing at what was on offer, exchanging greetings with acquaintances as I went. My goal was to reach the table with those unicorn bookends, without attracting the attention of Bludergard at the next table over. I was walking along silently, trying not to slip in the mud, when I felt an odd sensation on my calf. I glanced down and smiled. Murgatroyd was a bloodhound, with a magnificent pedigree and an even greater nose. His sense of smell could pick out a rose in a haystack, and I suspected that he had a better than even chance were he asked to find a needle there. He had helped unlock the mystery surrounding my uncle’s manor, and I had developed a fondness for the old boy. What I had felt just then was his marvelous snooter sniffing at my leg. He looked up at me and barked a greeting. “Back down a bit, old boy!” A dwarf in the blue uniform of Darbyfield’s finest hurried up to Murgatroyd and tugged on his leash. I was quietly grateful that Constable Alf Matterhorn had, for the only flaw that Murgatroyd had was his tremendous capability for producing drool. Had he stayed by my leg, his saliva would have caused a small flood at my feet, and Macalley would have been up half the night cleaning my favorite boots. I quickly remembered my manners. “Good morning!” I said to Matterhorn. Matterhorn shook his head and sighed. “I’d best make sure they haven’t hit the sauce too hard this morning.” We said our goodbyes and he set off, leading Murgatroyd as best as he could. I smiled as I turned away, but it quickly ran off and hid. I felt a dark pit open in the bottom of my stomach. The worst had happened, the absolute worst. Bludergard was approaching me with a handful of books. “What ho, Peavley!” he said. “What ho,” I replied, my eyes never leaving the stack of literary horror as it neared. My first thought on hearing that was about being grateful for small favors. I politely pushed it to one side. “How dreadful,” I said. “Oh, you really shouldn’t bother!” I said, trying to put as much honey in my voice as humanly possible. The toe of his shoe struck a clump of mud. It shot through the air with perfect aim and struck my right leg in mid-calf. It slowly oozed down towards my boot, forcing me to lift my leg as high as it could go. As the mud dripped towards the ground, I glared at Bludergard. “I’ll come back later,” he said, and took a rather quick leave. He tucked the towel away. As he did, I saw the top of a book peeking from his pocket. “Have you been shopping?” I asked. “I did stop by Madame Mabel’s table while waiting for a friend.” He showed me the book. “Ah. The new ‘Klondike and Canfield’,” I said. The series of books about the unlikely alliance between the elf policeman and the dwarf detective was one of Mabel’s top sellers. I chose to dodge the issue for now. “I’d best get back to helping Mabel,” I said cheerfully. “Very good, madame.” Macalley bowed slightly and headed off. With a smile on my lips, I headed back to Mabel’s tables, figuring that the rest of the day was going to go splendidly. I was soon to realize just how wrong I was. The moment of that discovery came just a bit later. Priscilla had headed to a nearby sandwich shop to get our lunches, and I had gone back to the carriage to fetch extra copies of the Skybright books. When I returned, I saw that Mabel was in a deep discussion with a customer. She had brought a small selection of out of print books with her, some of which were quite rare, and this fellow had a handful of them stacked in front of him. “200 crowns,” he was saying. “200 crowns!” the gent barked. It wasn’t until after the words had fled my lips that I saw who Mabel was speaking with. Somehow, I resisted the urge to add some choice curses to my dialogue. If ever someone wanted to paint a picture of arrogance personified, Lord Basil Oakton would make an excellent model. He’s one of those elves that give elves a bad name among other elves. He had long curly hair, a thick beard, and a sneer that he could use to slice bread were he not above such menial labor. I had had run-ins before with him; they had all ended in my favor, but Lord Basil was not the type to learn from his mistakes or concede that anyone, let alone a human or a female, was his superior. “You left out the word ‘pleasant’,” I murmured. “On purpose,” Oakton retorted. Another elf standing nearby made a noise that sounded very faintly like a snicker. I recognized Hillsboro, Oakton’s manservant. He was tall enough to be two Macalley’s, and had apparently bought out every muscle shop in the surrounding area, making sure to store plenty in the otherwise empty space between his ears. “You always have such a way with people,” I said to Oakton, keeping the irony out of my voice. Mabel blushed. “It’s an old, honored family name,” she said meekly. Bless her, she tried her best not to be embarrassed about her surname, but sometimes it happened. I waved my fingers in a farewell gesture. “Have a lovely day at the fair, now!” I said with overdone cheerfulness. Oakton snorted and spun away. As he did, his shoe caught a sizable clump of loose soddy mud, sending it towards me. It went too fast for me to dodge, smacking me on my left shin, just below the hem of my skirt. I heard Hillsboro snicker again as he followed Oakton into the crowd. “As if I had other options.” I sighed and stared at the mud and grass on my leg, trying to will it not to spill on or stain anything else. “I may not be,” I said, trying to rebalance myself. It was trickier than it sounds, as the book was quite heavy, and I still had the matter of the mud to deal with. “Over there.” I hopped in place and pointed with my foot at the stack I had dropped on the table earlier. “Sorry they haven’t been sorted yet,” I said. “Not a problem.” He tipped his hat and walked over to the Skybrights. I tried to hop back, keeping my balance while making sure that the dripping mud didn’t land on any books, boots or clothing. “Bring that back!” I twisted my head and saw Hesperia Fotheringay running towards me, carrying a glowing brass duck, her sister Antigone in hot pursuit while screaming rather impolitely. This was a sight that would fill me with horror under normal conditions, never mind when being twisted up more than a toddler’s first attempt at making a pretzel. I hopped in place yet again to keep from kicking either of them, barely staying upright as they passed. I sighed with relief and started to relax. To this day, I still don’t know how Murgatroyd slipped out of his bloody collar. It’s possible all his drool helped to loosen it. Regardless, the hound was running free and barking at full strength as he ran under the table, chasing the Fotheringays. I had to hop away from the table to keep from being bowled over. Even with my left leg stuck out in front of me, with one stubborn clump of sod clinging to my poor stocking – even while holding a ridiculously heavy book in my right arm while flailing my left about madly – I still managed to stay upright, and free of mud inside of my boots. Naturally, that’s when I bumped into Constable Matterhorn, who had made the mistake of not seeing me as he chased after Murgatroyd. I went sprawling back, my posterior landing on a bare spot on Mabel’s table. My left leg flew up further, which caused the clump of mud and sod to fly off my leg, execute a spiraling arc through the air, and land squarely in the middle of poor Matterhorn’s face. He staggered back, tripped over Murgatroyd who had picked that very moment to heed his master’s prompting and return at last, and fell into a large mud puddle. “Think nothing of it,” he said as a contented Murgatroyd rested his head on his stomach and promptly fell asleep. She stopped next to me and gasped at the sight of Matterhorn, still sprawled in the mud as Murgatroyd began to drool in his sleep. “Is it too much to hope that you brought a second?” the constable asked. “Alice?” Mabel and I saw Priscilla walking up to us, carrying a tray with tea and sandwiches. “Did I miss anything?” she said with a grin. Dear friend or not, only the fact that she had brought lunch kept me from flinging the book I held at her head. To everyone’s relief, especially mine, the day was much calmer after that. Macalley, who had dashed back to the manor for a bit of house-cleaning, had returned not long before the fair was scheduled to close. He brought with him two sturdy chairs and a handful of scones with cinnamon icing, and Priscilla and I were torn over which we were more thankful for. “How does she do it?” Priscilla said as she eagerly bit into her scone. “Who and what?” I asked as I stretched out my weary, mud-splattered legs. Priscilla shook her head and stuffed the last of her scone in her mouth. “That’s one problem solved,” she said as she chewed. “But so many things could go wrong!” This was typical of Mabel. She was the type who could see the endless potential problems in preparing a casserole, and worry herself sick about how much cheese should be layered on top. “Excellent plan!” Priscilla said. Mabel smiled agreeably. “And sample the prime rib at the steakhouse?” Priscilla said eagerly. “I was thinking more of a spinach and pepper quiche,” Mabel said with a pout. We finally resolved the discussion in favor of the quiche, with an unspoken agreement that the steakhouse would be our choice the following night. We managed to limit our wine consumption over dinner to one bottle, as neither Priscilla nor I wanted to repeat the sheer agony of that morning on Sunday with another long day facing us..
“It does seem quite unusual, madame. If you’ll excuse me?” I nodded, and Macalley hurried out of the dining room. I had just finished my croissant when Macalley returned. Although his expression is almost always as impenetrable as a suit of dwarfish plate armor being savagely attacked by a pillow, I thought I saw, for the merest fraction of a second, his eyebrow twitch very slightly. “Madame?” he said, with just the faintest hesitation. I knew that whatever it was, was serious. “Spill it!” I snapped. Macalley had the motorcar started quickly, and we drove to the town square. Once there, we saw the three tables, Mabel sitting at them with her head in her hands, and Priscilla trying to comfort her. For a moment, I wondered what had transpired, but then I remembered that the important part of this equation was what I wasn’t seeing. I jumped from the motorcar and ran up to my friends. “Mabel!” I shouted. Priscilla looked at me. “The carriage,” she said softly. “Not all of it.” I pointed back to Macalley, who was carrying the rare books over from the motorcar. For a moment, the despair that had Mabel in its grasp threatened to seize me as well. Her reputation would be destroyed, her sales would plummet. She might even lose the store she loved. I couldn’t let that happen to my friend. “I’ll do my best,” Priscilla said as she hurried off. “Very good, madame.” Macalley climbed into the motorcar and drove off. “And what will you be doing to help, Alice?” Mabel asked. I sat down next to her. “Staying with you,” I said as I laid a hand on my old friend’s. “I could never abandon you at a moment like this.” Mabel’s tears flowed again, but she was still smiling as she laid her other hand atop mine and squeezed it tight. The book fair reopened, and the first customers rushed to our tables. I told them that there had been an issue with our carriage, without explaining that the issue was that someone had run off with it, and that we would have the books here shortly, which I chose to regard as “optimism” and not “filthy lies”. It was, unfortunately, not long before word started to spread. Mabel had stepped aside to speak with Thurston, and I was watching the tables for her, when Bludergard decided to pay a visit. He slunk through the crowd like a dog trying not to get caught snaring the fallen and overlooked drumstick at chicken dinner. “What ho!” he said as he approached. “What ho, indeed,” I said with all the diffidence I could muster. I resisted the urge to tell him that leaving empty handed would be preferable to taking one of his books with them. “We’ll have our stock here soon,” I said calmly. Bludergard jumped as if someone had slammed a door next to his ear. He spun and ran back to his table, buttonholing the man who had wandered over there. Priscilla gave him an extended glance as she walked past. “He wasn’t trying to sell you one of his books, I hope,” she said as she sat down next to me. “The force is already searching the town, but it could take all day,” Priscilla said sadly. Mabel and Macalley returned almost at the same time, so I left Mabel with Priscilla and took Macalley aside. “I take it you had no luck?” I said. “Just like I wish you’d be,” I hissed under my breath. Priscilla hurried over to me and took my arm. “I’m sure it’ll show up soon,” Mabel said meekly. “It seems,” Oakton said with a smile that he apparently had to wrestle onto his face with a crowbar, “that you are the one who rejected the offer, not her.” He turned his smile on Mabel. “How about it, Blissbottom?” he said. He drew himself up to his full height. Anger creased his brow. “You be quiet, you spoiled, impertinent little dilettante,” he said. The words spilled from my mouth before I realized they were coming out. Time froze like water pipes in January. Every eye in the square was on us. Mabel covered her mouth with her hands. “Of course. Tradition.” It was my turn to force a smile as Priscilla grabbed my arm. “A moment, please.” She pulled me away and hurried off, Macalley close behind. “What the devil were you thinking!” Priscilla snapped. “I wasn’t expecting Oakton to do that.” I stared at the ground. “I always thought there were four,” Macalley murmured. “But it’s ‘Three’ in the title,” I countered. “If it means I can avoid a sad and bloody demise,” I said to him, “I’m very much all ears.” Priscilla nodded. Oakton’s snarl would have frightened a pack of guard dogs. “Tea dueling?” he snapped. “I thought we’d try something a little less gruesome than a knife fight.” I grinned an overdone grin. I had not had the pleasure of meeting Lady Sylvetta Travers until that day, and I quickly regretted that it had taken so long. “What a delightful surprise to meet you, my dear!” she said to me as we shook hands. “The pleasure’s mine,” I said. I had chosen an old favorite, a tan cloche with a wide brown band. “Why, thank you!” I said. “Yours is quite impressive as well!” And it was; Sylvetta wore a tall black top hat with red trim that went well with her ruffled red and black dress. I smiled and forced myself not to start bawling. “Thank you,” I said. Priscilla pressed her fingertips to her forehead. “Compared to him,” she muttered, “a basilisk is charming.” I was in complete agreement, but I still quietly shushed her. “Indeed.” Oakton produced a small, stuffed purse and handed it to Sylvetta. She waited until he had turned and left before she tucked it away in her bodice. “Very good, madame.” He bowed and set off. Lady Sylvetta had connections with a tea house near the town square, and soon the stage was set. There was a round table with two chairs, facing each other, and a smaller table nearby with a freshly-brewed pot of tea at the ready. Each chair had a cup and saucer set in front of it, with a sugar jar and a jug of milk in the center, and a plate covered with a napkin to one side. Sylvetta was standing by the small table, checking on the tea and consulting with Nadila. Her assistant was a sprite, lean and tall, in a stylish striped black waistcoat. “You are?” I said faintly. “I shall enjoy this.” Oakton smiled at me with a cruelness I’d never associated with tea and biscuits before. Hillsboro, who was serving as his second, snickered faintly. I snapped out of my reverie and tried not to gasp. It seemed that almost the entire population of Darbyfield and its surroundings had gathered in the square and were watching us intently. “I didn’t think that many people would have cared about this,” I mumbled. “Shall we begin?” Sylvetta said. “We should,” Oakton said. I nodded nervously. “Very well.” Lady Sylvetta lifted her head and addressed the crowd, with a voice that brought all the idle chatter and side-wagering discussion to a halt. “I bid you all a good morning, ladies and gentlemen! We have gathered to settle a matter of honor, in a peaceful way, between these two duelists. First, the challenger, Lord Basil Oakton!” He raised his hand to acknowledge the faint applause. “And his opponent, Alice Peavley of Peavley Manor!” I waved, and smiled at the somewhat louder applause, led by Priscilla. I glanced into the crowd, and past it. Mabel was standing at her tables, one eye on her rare books and one on me. She caught my gaze and smiled weakly. “Best of luck, Alice,” she whispered. “For those of you who are unfamiliar with the fine art of tea dueling,” Sylvetta continued, “I shall conduct a demonstration!” As she spoke, Nadila came over with a freshly-poured cup of tea, setting it down in front of her. She plunged the biscuit into the tea. “One! Two! Three! Four! Five!” As she finished, she lifted the biscuit up, holding it where everyone could see where it had absorbed the tea. “Now, you wait. At some point your biscuit, or your opponent’s, will begin to crumble. When that happens, the duelist with the intact biscuit must eat theirs cleanly. If they do so, they win the duel; if the biscuit breaks before then, the duel is declared a draw. Alternatively, one may avoid the mess and embarrassment caused by a collapsing biscuit by eating it before it can crumble. Should this occur, the duelist who eats their biscuit last, without it breaking, wins the duel.” She punctuated this by eating her biscuit. I folded my arms with phony nonchalance, for in fact, I was feeling very chalancy. “I am ready,” I said. With a faint sigh, Oakton got to his feet and extended a hand. I jumped up and shook his hand firmly. I would not let myself be intimidated by him, no matter how worried I was, when so much was at stake for dear Mabel. Thus, I made sure to loudly wish him good luck. His mumbled reply was either “The same to you” or “Go soak your head,” I couldn’t tell which. “Prepare the tea!” Lady Sylvetta exclaimed as we sat down. Nadila poured the tea, filling our cups up to the same level. I added a splash of milk and a generous amount of sugar to mine, as always; Oakton left his as it was. As I replaced the lid on the sugar jar, Sylvetta yanked the napkin off the plate in front of her. “Choose your biscuit!” she said. There were six identical rectangular biscuits on the plate. I recognized them as being dwarfish butter biscuits, thick and somewhat crunchy. I selected the one closest to me, and Oakton did the same. We took the biscuits between thumb and forefinger and pointed them downward at our cups of tea. I did my best to convince my hand not to tremble. “One! Two! Dunk!” Sylvetta said. We set our biscuits into the tea, held them there for the count of five, and pulled them up. I stared at my biscuit, trying to figure out how long it would hold together, how fast the tea would eat through it like a patio beset by liquid termites. I glanced over at Oakton, and that was a mistake, for he picked that moment to sneer at me. I’ve mentioned before that his sneer was imposing enough to make a charging bull stop in its tracks and amble off for a few bites of alfalfa. One would think that I’d have gained some immunity to that sneer, having been on the receiving end of it so many times since moving to Darbyfield. However, on this occasion, I was caught completely off-guard. I reared back ever so slightly, and my biscuit broke apart, dropping onto the table with an audible thump. Oakton smiled and ate his biscuit. “The first round goes to Lord Basil Oakton!” Sylvetta exclaimed. I reached towards the plate to take the biscuit closest to me. Before I could, Oakton shot out his hand, knocking mine aside as he grabbed the biscuit I had chosen. “I do say!” I exclaimed. He gloated at me. “I wanted that biscuit,” he said coolly. “The letter, yes,” she said, “as no dunking has taken place. But…” She glanced at Oakton in a way that left the unspoken “not the spirit” part of her sentence redundant. I took another biscuit and held it over my tea cup. “It’s not a surprise,” I said with a sideways glance at my opponent. “Of course,” Oakton said with a smirk as the count started. We dunked our biscuits. As we lifted them from the tea, I fixed my stare on Oakton’s biscuit, avoiding his glare. I thought about the rules, and the spirit of the game, and after another two seconds I stuffed my biscuit into my mouth. “You’ve conceded. You’ve admitted defeat.” Oakton lifted his biscuit. “Once I’ve eaten this, I will have won the duel.” He somehow managed to sneer as he opened his mouth. The biscuit broke. It fell onto Oakton’s chest, leaving a stain layered with crumbs on his immaculate white shirt. “What the devil?” he said. I sighed with relief as I took a quick sip of my tea. “Beginner’s luck,” Oakton remarked with a false casualness as Nadila refilled the tea again. “Yours, obviously.” I smiled as I took the last biscuit. “Begin!” came the command from Sylvetta. “Louse in all of Darbyfield,” I said quickly. Oakton stabbed his tea with his biscuit, while I casually dipped mine. “One! Two! Three! Four! Five!” Sylvetta counted. As we lifted our biscuits out of the tea cups, Oakton glared at me with all his might. “A louse, am I?” he snapped. “I must disagree.” I held up my biscuit. “Wha—” He glanced down at his as it broke in half. The loose piece spiraled downward, landing with a splash in his tea cup. “I seem to be quite proficient at tea dueling.” I smiled as I popped the biscuit into my mouth. Lady Sylvetta watched until I had swallowed. “A splendid match indeed! By the score of two rounds to one, the victor is Madame Alice Peavley!” Priscilla clapped me on the back as the crowd, save for those who had wagered on Oakton, cheered soundly. “Wha…?” Oakton looked and sounded dazed, as if he’d been conked with a sack full of freshly-caught fish. “And by virtue of her victory—” Sylvetta quickly, before anyone could think of ogling, plucked the pouch she had been given from its hiding place. “A donation of 150 crowns has been made to purchase books for the Darbyfield Library!” That caused the entire crowd to cheer. Sylvetta nudged me. “Handshake,” she stage-whispered. “Wha,” he said dazedly as we shook on it. “Wha.” Oakton picked up the saucer and tried to drink from it. Hillsboro took the teacup in one hand, grabbed Oakton’s arm with the other, and led him away. The crowd cleared out, the tables and chairs and such were removed, and I hurried over to Mabel, who gleefully embraced me. She was smiling more brightly than I had ever seen, and as much pleasure as I had gained from defeating Oakton, the joy I saw in her face brought me much more. “Madame Alice? You seem to have forgotten something.” Lady Sylvetta walked up to me with my teacup and saucer from the duel. “Absolutely.” I returned Sylvetta’s smile as we shook hands and said our goodbyes. Mabel’s eyes started to water. “It’ll be fine, Priscilla,” she said, lowering her head. “I’ll get by.” I took her shoulder and tried to comfort her. Our heads all shot up when we heard the familiar rattle. I glanced past the table and saw Macalley driving the motorcar up to us. “Madame Alice?” he said as he came to a stop. “Macalley? Did you…?” I held my breath, worried that I’d bring a jinx upon us if I completed the sentence. “I think he did!” Priscilla shouted over the clopping of horseshoes. Mabel clapped her hands and squealed with joy as her carriage, driven by two constables, neared the table. “My books!” she exclaimed, smiling ear to ear. “Macalley, you are truly amazing,” I said in hushed tones as he climbed out of the motorcar. He waved his hand. “It was something Lady Sylvetta said that helped me realize what to do…which was to seek assistance.” He whistled. “What a marvel!” Mabel crouched down next to the hound and bestowed him with a great deal of affection. I could only hope that Murgatroyd’s prodigious drool did not ruin her lovely dress. “So where was the carriage?” I asked. “We should let the constable answer that.” Macalley pointed to Constable Matterhorn. He and a colleague were escorting, in a very non-gentle way, another passenger off the carriage. I gasped when I saw it was Bludergard’s servant Stibbins. “You scum!” Priscilla hissed. I grabbed her arm to keep her from inflicting grievous and possibly much-deserved harm. “Since when is anything coming from his mouth honest?” Priscilla murmured. “Someone in desperate need of kindling?” I suggested. “Absolutely,” Bludergard said as he walked over from his table. Mabel’s jaw dropped. Macalley and I exchanged glances. Priscilla pressed her fingertips to her brow, shaking her head slowly. Even Murgatroyd seemed baffled. Matterhorn shrugged and released Stibbins. “Can’t charge you with anything right now,” he said with clear reluctance. “But stay out of my sight for a while.” Stibbins nodded and ran off, presumably towards the same pub where he had spent part of the previous evening. “We’ll be looking into this further.” Matterhorn walked over and took Murgatroyd’s leash. “Good luck with your day,” he said to Mabel as he half-walked and half-dragged the hound off. He turned as Augustus Thurston marched up to him, blood in his eyes. “Poppycock?” he said feebly. “Such strong language,” I murmured. “But the books have been returned!” Bludergard said. “A true act of bravery,” I noted. Thurston pushed Bludergard’s book into its author’s hands as if it were contagious. “Pack up and go,” he said. The book fair staff grabbed Bludergard and dragged him away. “I feel bad about this,” I said to Priscilla. “I’ll stand the first round.” We linked arms and started to go. “Get back here, you two!” Mabel shouted, trying to unload her carriage with Macalley’s assistance as booklovers swarmed her tables. Priscilla and I broke out in laughter as we hurried over to help. “She’s a bit busy at the moment, madame.” Macalley came up to me and pointed over at Priscilla. Thurston had returned and was in much better spirits, having successfully banished Bludergard and his offending volumes from the fair. With the crowd mostly cleared out, he and Clarinda were choosing books from what remained of Mabel’s stock for the Darbyfield Library. Clarinda would point at a book, and there would be a brief discussion. Thurston would then nod if the book met with their approval, and he or Clarinda would take the book and set it in the stack that Priscilla was carrying, which now reached past her shoulders. “Maybe a touch too generous,” Priscilla said half to herself. “Marvelous!” I sipped my tea. “And quite heavy,” Priscilla said, glaring at me. “Perhaps we should dedicate this collection to you!” Thurston tossed a thick book onto Priscilla’s stack, staggering her. Priscilla rolled her eyes. “You finally noticed,” she said. “No, but I still need to make a purchase of my own before the fair closes.” I removed a handful of books from Priscilla’s stack and handed them to Macalley. “The unicorn bookends?” he said, putting in a supreme effort to keep his disappoint and reproach under control. “As you wish, madame.” I chuckled at the faint hint of sorrow in Macalley’s voice as I piled more books in his arms. I have only recently discovered the fine tradition of tea dueling. As of this writing, I have not yet had occasion to engage in tea dueling, a situation I hope to correct some day; I’ve had to make do with numerous enjoyable YouTube videos. I must acknowledge the people who have promoted it, and those who helped to make this first Peavley Manor tale possible. First, thanks to Doctor Geof and Tinker (a.k.a. Geof Banyard and John Naylor) for creating the marvelous sport of tea dueling.To find the rules, head to http://teaduel.yolasite.com/ ! Many thanks and much gratitude to the magnificent Madame Askew (a.k.a. Jocelynne Simone), who gave very generously of her time and knowledge of tea dueling. 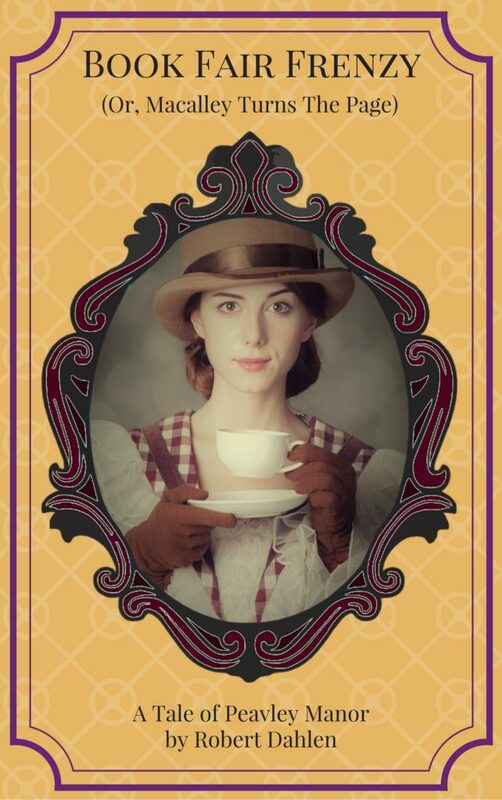 She is a credit to tea dueling, and to the steampunk community in general! Find out more about her and her Temporal Entourage at https://www.facebook.com/MadameAskew/ ! Thanks to Michelle Lovi for last-minute cover advice, and to Colleen, DL, Craig and Vane for encouragement along the way. Extra special thanks to awesome pal Shei Darksbane for helping with the formatting! And finally, many thanks to Amber Goss for telling me about tea dueling, encouraging me to develop Alice and Macalley and write this story, convincing me to go with tea dueling as the method to resolve the main dispute, introducing me to Madame Askew, and helping with the cover design. Cheesy fries owed to Amber as of this writing: 5. © 2017 Robert Dahlen. All rights reserved.